View our emerald cut diamond rings here. The most important day of your life is fast approaching and you're bogged down with a million things to do, from selecting the wedding dress to picking out a cake to making sure your embarrassing fifth cousin thrice removed doesn't show up to enliven the festivities. Gosh, when are you even going to have time to do important stuff, like find the ugliest possible bridesmaid dresses and pick out your rings? As significant as the latter task may be, too often we let it slide until the last minute, then pick out the traditional boring rings that everyone else has. Remember, you'll be wearing these rings a good long time -- at least you hope so, right? At this point, let us interject a suggestion: have you considered emerald cut diamond rings? What makes emerald cut diamond rings so special, you may be wondering? Why, they offer classic, unforgettable style that's an alternative to the same old round-cut and marquise diamonds that most of us settle for. As the name implies, emerald cut diamond rings are adorned with diamonds cut like emeralds. The emerald cut was developed to address the peculiar properties of emeralds, which are often brittle and flawed. The stepped rectangle cut with cropped corners was soon found to be applicable to other stones; hence, the lovely emerald cut diamond rings that any jeweler would be happy to supply you with. 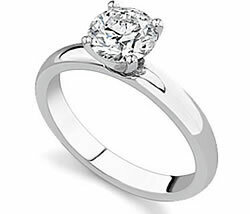 Emerald cut diamond rings have several advantages over other diamond rings. First of all, emerald cut diamond rings aren't as trendy as rings with princess cut or round brilliant diamonds, so they often cost significantly less. Consider, for example, two one-carat diamond rings that are basically identical, except that one has a round brilliant stone, and the other an emerald cut stone. The emerald cut diamond ring goes for a whopping $1,500 less - not exactly chump change. This means that with emerald cut diamond rings you get more bang for your buck, so you can afford a bigger diamond if you want one. Second, because of the nature of the cut, with emerald cut rings, it's easier to spot flaws, poor cuts and undesirable colors than it can be with other diamond cuts. Then, too, emerald cut diamond rings can be worn with similar ease by both men and women. While many men go with understated, plain bands when they choose their wedding rings, you may prefer to add a little bling to your ring. Emerald cut diamond rings offer a more masculine option than round, princess or marquise cuts can. But lest we forget, emerald cut diamond rings aren't just for weddings. They also make excellent engagement rings, especially for the lucky lady. For example, Donald Trump offered a fabulous 12-carat emerald cut diamond ring to the prospective missus, Melanie Knauss several years ago and history records that she said "yes" to his proposal. If an emerald cut diamond ring worked for Donald, why not go with a proven formula? At Novori, we have a wide variety of emerald cut diamond rings, for every budget and every personal style.